Within just the past couple of decades, technological advancements and savvy entrepreneurs have brought an unimaginable level of convenience to the world. Our mobile devices place the world at our fingertips, semi-autonomous vehicles roam the streets and home automation systems allow you to flick on the lights and TV with only your voice. Another modern product is the proliferation of electric-scooter rental services. 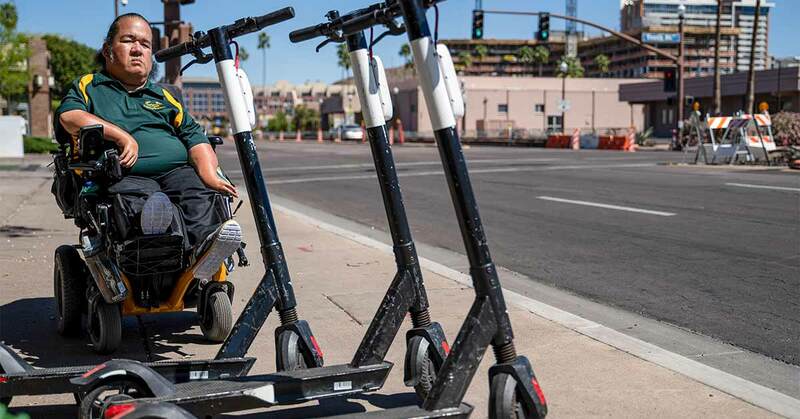 For as little as $1 to rent and 15 cents per minute, companies like Bird, RazorUSA and Lime give pedestrians an affordable and easy way to make quick trips around the city. With top speeds reaching 15 mph, people can rent a scooter through their mobile device and zip around. In addition to the convenience, a selling point for these scooter-share services is that people can rely less on cars and public transportation, reducing our carbon footprint and our dependence on fossil fuels. However, this wildly popular mode of transportation is not without its issues. One of the most prevalent is that scooters are overtaking sidewalks. Not only are people weaving in and out of pedestrian traffic at high speeds, but riders are often leaving scooters strewn across walkways, obstructing paths. Although many people can walk around, or move the scooters, this is not feasible for those who use mobility devices. This is especially problematic for wheelchair users, who are forced to either knock the scooters out of the way–using their own wheelchair–or find another route. In San Diego, a lawsuit has been filed against the city and rental companies due to the dangers that riders impose on pedestrians. 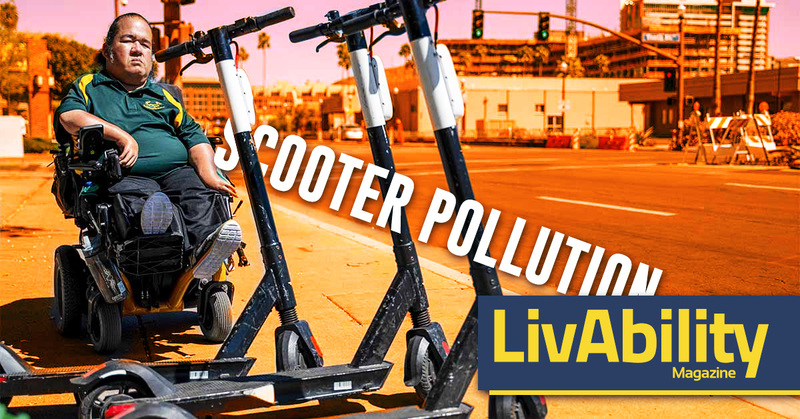 Because of the sheer number of scooters and the multitude of problems they have caused in such a short period of time, many cities have enacted regulations with the hope of alleviating the issues. Some companies, like Lime, have found the new rules to be too restrictive. In late-February, Lime pulled out of Tempe, Arizona, and RazorUSA is considering similar action. Although not a problem directly caused by scooters and the rental companies, there is also a complete absence of accessible rental options for manual wheelchair users or those who can walk with the use of mobility aids. While manual wheelchair users can propel themselves, long distances can take a toll on the upper body. For some people who walk with mobility aids, the process can be slow, and accessible scooter options could help make traveling short distances safer and more efficient. Currently, there are products, such as FreeWheel, that are available and mount to a manual wheelchair. The FreeWheel lifts the casters off the ground, allowing the wheelchair to roll over most obstacles; e.g., curbs, gravel, or sand. The electric-scooter craze is not going away anytime soon. Neither are pedestrians, those living with disabilities. Scooter-share companies and the cities in which they operate must continue working together to create realistic, workable solutions to ensure the safety of everyone, while still allowing riders to enjoy the convenience and freedom given by our new electric scooter overlords electric scooters. Tony Jackson is a graduate of the Walter Cronkite School of Journalism and Mass Communication at Arizona State University. 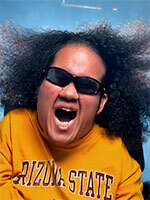 He started playing power soccer in 2009 and has no plans to stop anytime soon. In addition to being an athlete, he puts his journalism skills to use as a broadcaster of power soccer tournaments around the world. He is currently a player and coach in New Hampshire. Read more by Tony Jackson.